Gija Joseon (? - 194 B.C.E.) describes the period after the legendary arrival of Gija in northern (or in the northwest of) Korean Peninsula. Most of the Chinese and Korean scholars consider the era of Gija Joseon as a part of the Gojoseon period (2333 B.C.E.-108 B.C.E.) of Korean history. Korean scholars generally consider Gija Joseon an embellishment in Korea history while Chinese scholars accept the legendary city-state as historical. Koreans point to Gija as a co-founder of Korean civilization along with Dangun. Dangun may have appeared on the scene in Manchuria as early as 3000 B.C.E., having ethnic roots in China, whereas Gija is alleged to have appeared from China in 1222 B.C.E., more than 1000 years, and maybe 2000 years, later. Historical documents specify the existence of Gija but not necessarily Gija Joseon. The matter of Gija and Gija Joseon actually existing may never find resolution but the importance of Gija and Gija Joseon to Korean's understanding of their origin, is indisputable. Chinese records before the third century B.C.E. describe Gija as the paternal uncle (or brother, in other records) of the last emperor of the Chinese Shang Dynasty, the tyrannical King Zhou, but contain no mention of his relationship with Gojoseon. Tyrant King Zhou imprisoned Gija until the downfall of Shang Kingdom, when legend states thatKing Wu of Zhou released him. The above suggests that Gija had a limited role in ancient Korean history. The Genealogy of the Seonwu Clan of Taewon (태원선우씨세보, 太原鮮于氏世譜) lists the names of forty one rulers of Gija Joseon and their periods of reign, although it is not widely accepted by mainstream historians. Some scholars believe that Wiman Joseon began with the usurpation of the throne from the line of kings descended from Gija. Those records made no references to Jizi being associated with Joseon by King Wu or his seizing power in Joseon. Archaeological evidence suggests Chinese bronze culture differed dramatically from Korean bronze culture and Korea never used the Chinese writing system during that period. 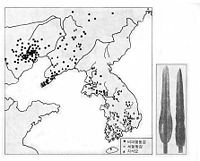 Until evidence put the Gija/Jizi theory into doubt, scholars widely believed that Gija Joseon located in current Korea, replacing Gojoseon of Dangun. Some scholars, who try to reconcile the Book of Han account with archaeological evidence, believe that Jizi settled west of Beonjoseon, based on the Book of Han's assertions and Korean record of Samguk Yusa, arguing that the records suggest that Gojoseon continued to coexist with Gija Joseon after the migration of Jizi. These scholars believe that Jizi's influence was limited to western Gojoseon, west of Liao River. Historian Kim Jung-bae argues that the association between Jizi and Joseon has generally been disproven. He believed that the Han Dynasty fabricated the existence of Gija Joseon and that Jizi established it as a state. He, and other historians holding similar views, point out that the Bamboo Annals and Confucius's Analects, constituting the earliest extant texts that referred to Jizi, said nothing about his going to Gojoseon. Similarly, the Records of the Grand Historian, written soon after the conquest of Wiman Joseon by Han, made no reference to Joseon in its discussions about Jizi and made no reference to Jizi in its discussions about Joseon. Kim, and other scholars holding similar views, believe that the contradiction in the account arose from a confusion between Jizi and Gihun's ancestor, Gija. Scholar Shin Chaeho asserted that Gija Joseon (323 B.C.E.-194 B.C.E.) refers to the putative period of Beonjoseon, one of the Three Confederate States of Gojoseon, after Gihu (기후, 箕詡) became the king of Beonjoseon. Chinese traditional accounts see Gihu's ancestor, Gija, as the same person as Jizi (both written as 箕子 in Hanzi/Hanja), although such theories largely discredited due to lack of archaeological evidence supporting such accounts, and due to the lack of corroborating textual evidence from relatively contemporary Chinese accounts. According to Sin Chaeho's Joseon Sangosa, Beonjoseon began disintegrating after a rebel from the Chinese state of Yan killed its king around 323 B.C.E. With the assassination of the king, the five ministers of Beonjoseon contended for the throne. Gihu joined in this struggle, emerging victorious as the new king of Beonjoseon by defeating the competitors for the throne. He established Gija Joseon, named after his ancestor Gija. During Gija Joseon, the king enjoyed strong sovereign powers. Eventually, in 94 B.C.E., Gija Joseon fell after Wei Man overthrew King Jun, establishing Wiman Joseon in its place. ↑ Tae Hung Ha Iryŏn and Grafton K. Mintz, Samguk yusa; Legends and History of the Three Kingdoms of Ancient Korea (Seoul: Yonsei University Press, 1972). ↑ dbpia.co.kr, Old Chos on and the Culture of the Mandolin-shaped Bronze Dagger. Retrieved October 9, 2007. Imanishi Ryū 今西龍. 1970. Kishi Chōsen densetsu kō 箕子朝鮮伝説考, Chōsen koshi no kenkyū 朝鮮古史の研究 Tōkyō: Kokusho Kankōkai, pp. 131-173. Kuwano Eiji 桑野栄治: Richō shoki no siten wo tōshite mita Dankun saishi 李朝初期の祀典を通してみた檀君祭祀, Chōsen Gakuhō 朝鮮学報 (Journal of the Academic Association of Koreanology in Japan), Vol. 14, pp. 57-101, 1959. Jae-hoon Shim. A New Understanding of Kija Chosŏn as a Historical Anachronism, Harvard Journal of Asiatic Studies, Volume 62 Number 2, pp. 271-305, 2002. This page was last modified on 14 December 2013, at 19:42.